Waterfalls in Switzerland don’t seem too unusual. It snows, and in the spring water cascades down the mountains making lovely scenery. But when the waterfalls are inside a mountain the scene becomes even more spectacular. That’s what we found at Trummelbachfalle where ten glacier waterfalls rumble, tumble, and spray over and through rock formations. 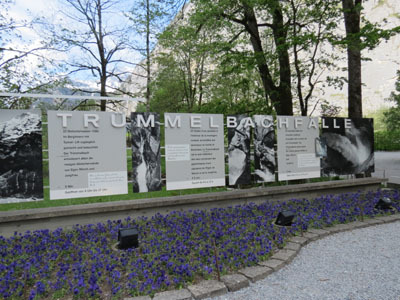 Located a few miles from Lauterbrunnen near the tiny village of Stechelberg, Trummelbachfalle was our first stop when heading to Interlaken from the Jungfrau region. Accessible by tunnel lift, some of the waterfalls are illuminated, which highlights the immense flow—20,000 litres of water per second—as water pours from the glaciers on Eiger, Monch, and Jungfrau Mountains. In addition, the water carries 20,200 tons of boulder detritus per year that finds its way into Switzerland’s many rivers and lakes. Water flows in a twisty corkscrew pattern. As we rode in the lift to see the waterfalls, faint rumblings gave clues about what was happening deep inside the mountain. An amazing engineering feat has created walkways for visitors to witness the only glacier waterfalls in Europe that are inside a mountain and still accessible. Some of the waterfalls are long, deep, and dark, casting cool spray on our faces as we walk by. Others closer to the outside world can be seen with natural light as they wear away rock walls. One of the most interesting was Corkscrew Falls, which twists and winds through a convoluted rock formation deep in the cavern. 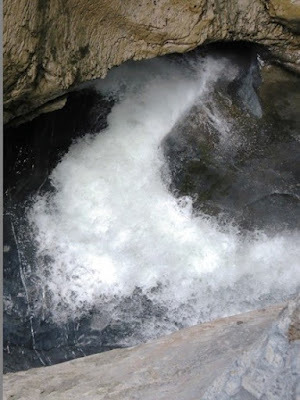 All give off resounding echoes as they crash with a powerful flow of water. Powerful water splashes through the rocky mountain. Allow at least an hour to see the falls. You go upstairs to view falls six through 10 and downstairs to see two through five. 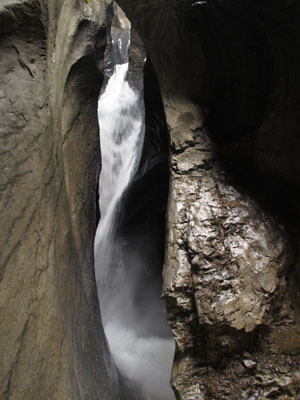 Number one starts inside the mountain but is visible outside pouring water into the river that disperses the glacial flow further downstream. After exiting Trummelbachfalle, we stopped at the outdoor tent operated as a fundraiser by local groups to get a cold drink and snack. Fields across the street were filled with early spring flowers blooming in shades of yellow, white, and purple—and there was yet another waterfall to photograph.